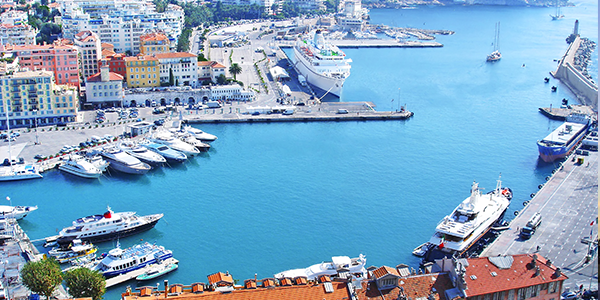 Nice is a compact busy city and the port is at the heart of the area. If you are starting a cruise from Nice Port, it is advisable that if you need parking to book in advance. Otherwise, you may incur more expensive prices or run the risk of the car parks being full. To book Nice Port parking, enter the dates and time at which you plan to drop off/pick up your car in the box above. You can obtain a free quote and book online very easily. There is more information on any parking option. Just click on the car logo and you will see a map where it is located and a lot more details. The Port of Nice is the first port for importing cement in France. It is also an important mooring location for the many yachts and sailing boats along the French Riviera. Nice Port is also called Port Lympia because of the source which runs into a lake situated in the swamp where the construction of the port started in the 18th century.